Gwendolyn Zepeda's New Novel, "Lone Star Legend"
Hello! I'm back. Yes, I came out of hiatus especially for Gwendolyn Zepeda who may or may not be my cousin. My mother's maiden name was Zepeda and there aren't hundreds of Zepeda families in Houston like Garza or Garcia. So you never know! We haven't done our family tree to find out. Ironically enough, Zepeda will be reading with a Casares (as in Oscar) this May. My two family names together for a reading. 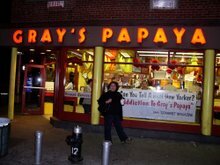 But on to the real reason of my coming out of hiding, or more like out of Hips 'n Salsa and skirt! 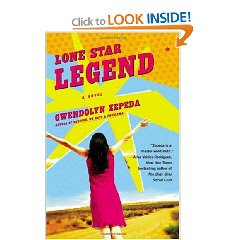 I wrote a review of Gwendolyn Zepeda's new novel, Lone Star Legend on skirt! today and I wanted to point you all in that direction. If you are too lazy to click on the links I will give you a quick synopsis here. Lone Star Legend is a hilarious account about Sandy Saavedra, a blogger who has her own personal blog (like Gwen's pesonal blog, except Sandy's is anonymous) and she also works for a Latino celebrity gossip site. It wasn't a gossip site originally. Sandy was trying to be a serious journalist before a big media company came in and took over. They not only re-name the blog she works for, they name it "Nacho Papi" of all things. They add this to their collection of other websites, "Don't Call Me Sassy," "Banana Nation," and "Hate-O-Rama.com." Sandy is mortified with the new name and the type of site, but she decides to make the best of the situation and that's where the story takes off. Sandy meets Tio Jaime, who the Nacho Papi readers nickname, "The Chupacabra" and he changes her life in more ways than one. She learns more about herself, her ambitions and her ethics. Lone Star Legend is a great read that I finished in only two days. It was one of those books I didn't want to put down because I wanted to find out what would happen to Sandy next. I'm sure you'll do the same. Check it out on Amazon.com or your neighborhood bookstore.